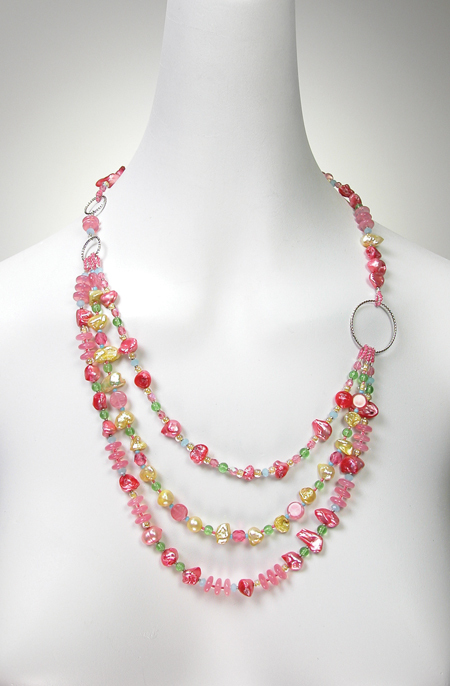 HONEYSUCKLE’s elegance radiates when it is combined with light tints, as Candace Cloud McLean has done in this sweet springtime-fresh necklace of glass and freshwater pearls. Last year the color of the year was a refreshing, relaxing Turquoise, which you can read about in the February 2010 Margie’s Muse. “While the 2010 color of the year, PANTONE 15-5519 Turquoise, served as an escape for many, Honeysuckle emboldens us to face everyday troubles with verve and vigor. A dynamic reddish pink, Honeysuckle is encouraging and uplifting. It elevates our psyche beyond escape, instilling the confidence, courage and spirit to meet the exhaustive challenges that have become part of everyday life. Twice a year I create the Color Report for Bead & Jewelry Designers. Within it’s digital pages, by way of instructions, examples, proportion-specific palettes, and beadwork, I demonstrate how to work with the 10 specific colors that Pantone has forecasted for the current season. The 2011 Spring/Summer Color Report for Bead & Jewelry Designers (PDF) is available for download for $9.95.